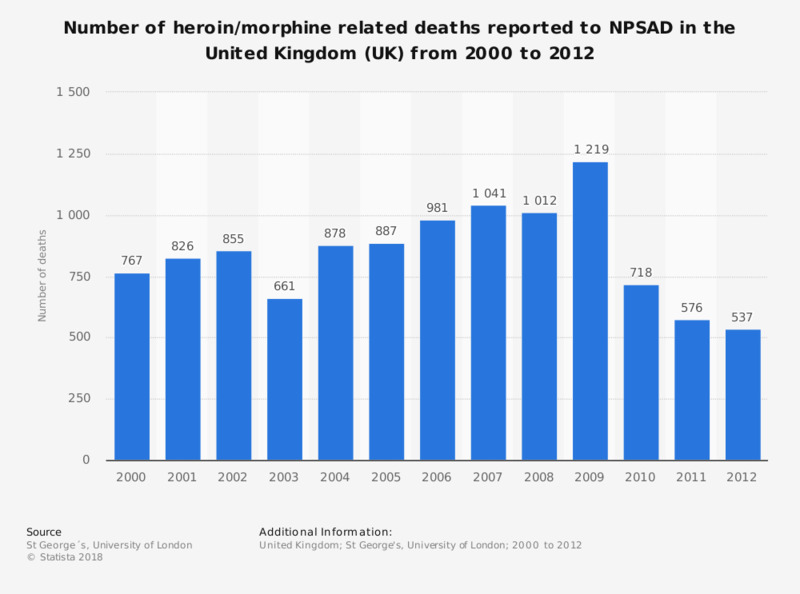 This statistic shows the amount of heroin/morphine related deaths reported to NPSAD in the United Kingdom from 2000 to 2012. Figures rose almost every year from 2000 to 2009, at which point heroin/morphine related deaths reached their peak of this 13 year period. After this, deaths fell significantly and continued to decrease in number each year up to the most current figure of 537 for 2012. * Data also includes figures from Guernsey, Jersey, and the Isle of Man. National Programme on Substance Abuse Deaths (NPSAD) drug-related deaths are those deaths reported voluntarily to the NPSAD by coroners. - Cases with deaths directly due to drugs but with no inquest. The deaths detailed here are those which involved heroin/morphine as an implicated substance. There may also have been other implicated substances in any of these cases.